A true open-air theatre, Naples is filled with boisterous, winding streets that are a treasure trove of historical, artistic, and architectural surprises. Naples is bursting with colours and juxtapositions, such as the enormous, lavish baroque palaces and churches that pop up in middle-class neighbourhoods. Or even the locals’ dramatic body language and expressions, straight out of the Commedia dell’Arte, that are both joyous and melancholic. Naples is also a city with its own culinary traditions, where pizza has become an institution, where you’ll find seafood dishes by the hundred, and where pastries—like baba, pastiera, or sfogliatella—taste as amazing as they sound. 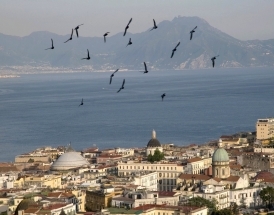 Nicknamed the sunshine city, Naples is the ideal starting point for excursions to islands like Ischia, Procida, and its pearl, Capri, in the Bay of Naples; for visits to the ruins of Pompeii or Herculanum; for hikes to the summit of Mount Vesuvius; or simply for daytrips around the Amalfi Coast. A quiet and pleasant studio in the heart of Naples and only a stone’s throw from the sea. The magnificent balcony off of this spacious apartment affords a panoramic view of Naples' historic centre and the Certosa di San Martino hill. A spacious and comfortable apartment in the center of Naples, with a magnificent panoramic view of the city and bay. A quiet and bright apartment with a terrace in the heart of Naples.